From managing monthly bills to trying to find a happy medium between time spent at work and with loved ones, daily living is often a balancing act that is anything but easy. Trying to juggle one’s career, family life and countless other responsibilities can be stressful and may even lead to potentially serious physical and mental health consequences if stress is allowed to spiral out of control. Knowing someone cares and can offer expert advice for many of life’s challenges may provide just the peace of mind needed for when circumstances take an unexpected turn. 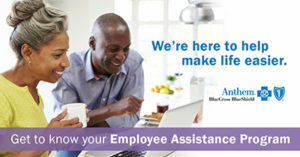 The Anthem Blue Cross/Blue Shield Employee Assistance Program (EAP) can help! All State of Indiana employees qualify to receive assistance through the EAP, regardless of whether or not they are currently enrolled in a healthcare plan. Legal advice, financial management, and tips for how to live life to the fullest are all available through the EAP. Getting started is easy: just visit anthemeap.com and use the login State of Indiana. From there, you can access many options for help with issues ranging from managing depression to finding childcare to acquiring legal aid all at the touch of a button. Problems with your relationship? EAP can help! Trying to make ends meet? Get sound financial advice from EAP professionals! Want tips on how to live a healthier lifestyle? You guessed it – contact EAP! The EAP also offers up to three free “face-to-face” counseling sessions at no charge. Additionally, appointments to speak live online with a licensed therapist can also be made in a matter of days, and a range of mental health topics is covered. Visit https://livehealthonline.com/ for more information. Additionally, the EAP website features a blog called “The Wellpost” that houses articles covering topics ranging from planning a family game night to helping a child cope with grief and loss. Through the EAP, State of Indiana employees can learn how to create a better work-life balance, get a handle on stress, manage their money and much more. State of Indiana employees can call 800-223-7723 24/7 for help. There is always a caring voice on the other end of the line – no paperwork, no appointment, no charge. All assistance is confidential. The Anthem EAP is here to help – through life’s sunshine and its occasional unexpected rain. There is calm and peace of mind when those clouds clear, and often some sound advice from a caring professional can help weather the storms of life. Make the most of a valuable service available at your fingertips each and every day of the year. do you get 3 sessions or 8? earlier it posted as 8 free face to face counseling sessions.